Stranger things can happen in a topsy-turvy political culture, so keep in mind philosopher George Santayana’s advice that we not ignore history. 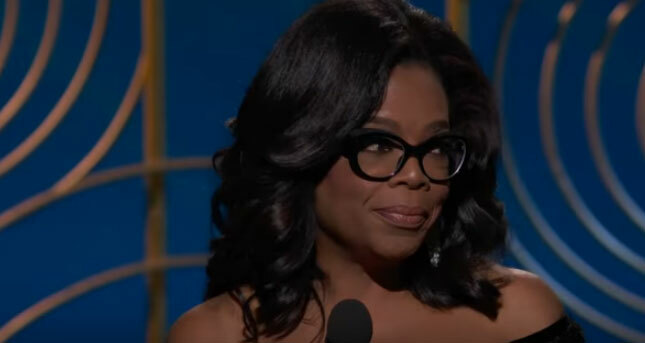 Oprah Winfrey speaks at the 2018 Golden Globe Awards program January 8. The #Oprah2020 hashtag bandwagon took little time to get rolling, doubtless more so among the “never Trump” element of the society and the electorate than among the strategically targeted electoral college critical mass itself. So can the “Oprah 2020” and climate change/global warming bandwagon be far behind, given the lessons many think they have learned from the last presidential election about never dismissing even the most unimaginable campaign candidate as being too far a reach? Think there’s no Oprah-climate change connection at this point? Don’t be so sure. Neither piece specifically addressed climate change per se, notwithstanding some readily available online examples of Oprah’s (one need not even use her last name in her case) having addressed the issue over her years as a TV celebrity. There is here, of course, a sheer danger in one’s getting ahead of their skis: Think here of Robert Frost’s so aptly having warned us with his “miles to go before I sleep” closing to “Stopping by Woods on a Snowy Evening.” And that’s without even considering such arcane – not mundane – issues such as competence to adequately manage an enormous and complex bureaucracy facing a multitude of domestic and global challenges; such as willingness and appetite to endure endless months of fund-raising, saber-rattling, name-calling, innuendo, arduous campaign rituals, 24/7 work demands … and so much more. Most of it even less appealing. On the other hand, who among us could have predicted, less than one year into President Obama’s second term, a successful presidential candidacy by Donald J. Trump, at the time a real estate and construction magnate and a reality TV celebrity blow-hard? Wasn’t that at least as improbable as an Oprah candidacy/nomination/presidency seems now? “Those who don’t learn history are doomed to repeat it,” Spanish writer and philosopher George Santayana is credited with advising us, albeit not in those exact words. So. Oprah and climate change. Where, alas, does she stand? Does she stand at all on the issue, other than as might be expected of one who for decades has hosted a widely popular television program to the extent that her first name is all that is needed to identify her to most would-be voters, as with, for instance, Cher or Bono. Google, if you will, a term like “Oprah and climate change” or “Oprah and global warming” or some variation on that theme. You’ll not come up empty. But don’t go searching with an expectation of finding in-depth position papers as one might anticipate from a “real” candidate. Or, for that matter, from a sitting President or EPA administrator, to, ahem, cite two current examples. Winfrey on her program has hosted in-depth conversations, by TV talk-show standards, with the likes of Al Gore, actor and climate activist Leonardo de Caprio, and Princeton University climate scientist Michael Oppenheimer, PhD. Her program has included segments with an obviously well-informed audience member explaining the real significance of a temperature change some might wrongly dismiss as just a de minimis change of one or two degrees Fahrenheit … as if it were weather and not climate we’re considering. Questions, concerns, and full-throated doubts do, and clearly should, abound with any such Oprah “candidacy” … particularly, as in this case, if it isn’t even one at this stage. All are proper and welcome at this point. But remember too the lesson from Santayana and its applicability, in these unusual times, to presidential electoral politics – and to the critical issue of climate change. An Oprah candidacy? Stranger things could happen. And do. Image credit: 2018 Golden Globe Awards video.